Every love story is beautiful; theirs is definitely one of our favourite. Three years ago, they shared a magnificent sunrise as strangers overlooking Mount Bromo, at a secret spot, away from the crowd. Fast forward to present, their relationship stood the test of time (and distance too!) and everything else was history. 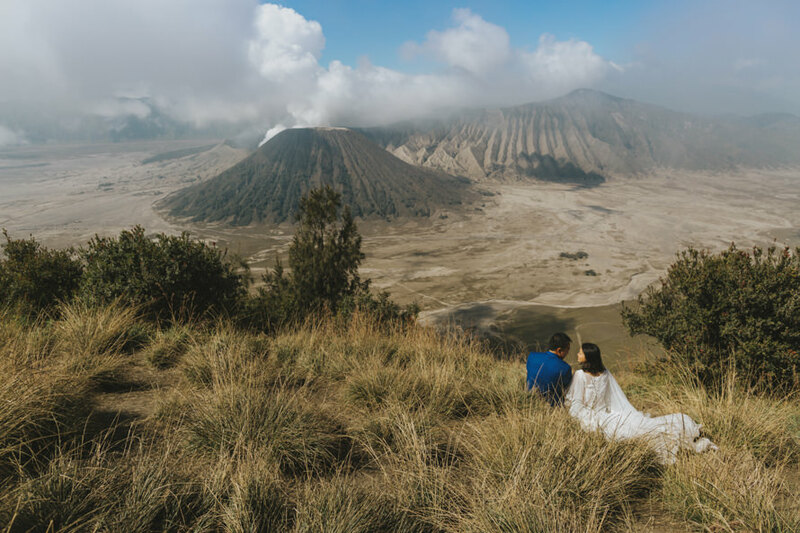 We initially settled on an easily accessible Mount Bromo view point as it was impossible to get to their secret spot without scrambling on all fours. But we knew how much it would mean to them to revisit that exact same spot where they met, as it was their very sense of adventure that had brought them together. So at 4am, we set out in the dark on a bumpy jeep ride, followed by a hike up steep slopes and narrow trails above 2000m. The stars blanket above us, as they retraced their steps, this time making their way up there together. It was a privilege exploring the diverse landscapes with these two – the mountains, the forest, the desert and the sea. Nothing short of an adventure in itself!